Rapid urbanisation, unhealthy lifestyles and demographic transition towards an ageing population have ensured firm and ubiquitous entrenchment of the tentacles of non-communicable diseases (NCDs). In 2016, NCDs accounted for 71% deaths globally. Once thought to be the rich man’s disease, NCDs today are responsible for over three-quarters of deaths in low and middle-income countries (LMICs). Moreover, a substantial proportion of these deaths occur prematurely, among those in ages of 30 to 69 years, leading to incredible economic losses resulting from the untimely loss of productive population. Over the next 15 years the human and economic costs of NCDs are projected to total more than US $7 trillion in developing countries. NCDs have come to dominate the global burden of disease but the proportion of all global health financing dedicated to combatting the pandemic has remained constant over the past 15 years at 1–2%. WHO’s report titled ‘Saving lives, spending less: a strategic response to NCDs‘ estimates that for every US$1 invested in scaling up actions to address NCDs in LMICs, there will be a return to society of at least US$7 in increased employment, productivity and longer life. Being the world’s leading killer and having the potential to bankrupt health systems, a strong case exists for investing in resources to prevent and treat NCDs. NCD management interventions are also imperative to achieve the global targets articulated by the United Nations (UN) and World Health Organization (WHO). 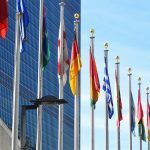 Recognising the devastating socioeconomic effects of NCDs, the United Nations General Assembly (UNGA) has convened two High-level Meetings on NCDs, with the third one scheduled for later this month. The first meeting took place in September 2011, only the second such on a “health issue” (after HIV/ AIDS). Global leaders committed to the UN Political Declaration on prevention and control of NCDs, acknowledging the primary role and responsibility of governments in responding to the challenge of NCDs. The second meeting took place in 2014, where the outcome document stated four time-bound commitments – national plans, targets, best buys for prevention, and health systems strengthening. 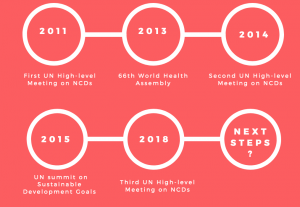 Prior to this, in May 2013, the 66th World Health Assembly had endorsed the WHO Global Action Plan for the prevention and control of NCDS, 2013-2020 that followed up on the UN’s Political Declaration on the Prevention and Control of NCDs. This plan aims at reduction of the number of premature deaths from NCDs by 25% by 2025 through nine voluntary global targets. In September 2015, at the 2030 UN Summit on Sustainable Development, NCDs yet again got much deserved attention with the formulation of ‘Sustainable Development Goal (SDG) target 3.4’, which commits countries to reduce premature mortality from NCDs by one-third by 2030. So, what now? Why is the third UN High-level Meeting important? The above-mentioned goals have made countries accountable to deliver on commitments made at previous High-level Meetings on NCDs. The third UN High-level Meeting will provide a platform to governments and heads of state(s) to assess the progress achieved in addressing NCDs so far and recalibrate their political commitments. It will also be instrumental in laying down goals for the period between 2018 and 2030, while forging consensus among attendees. It is for this reason that the third UN High-level Meeting is being hailed as a pivotal moment in the global fight against NCDs. The meeting will take place on 27 September 2018 at the UN Headquarters in New York. The theme of the meeting is ‘Scaling up multi-stakeholder and multi-sectoral responses for the prevention and control of non-communicable diseases in the context of the 2030 Agenda for Sustainable Development’. It will include panels on health systems strengthening and financing for prevention and control of NCDs, promotion of multi-sectoral partnerships and discussion on each country’s opportunities and challenges in engaging governments, civil society and private sector. It will also look into financing for NCD prevention and control, the need to strengthen international cooperation, accountability mechanisms, and ways to manage the commercial determinants of NCDs. Vatsla is public health communications intern at C3 Collaborating for Health. She did it! Thanks for your support!